Researchers at the University of Arizona (UA) believe that the microbes in a dog’s gut can encourage the growth of positive microorganisms in humans. They’re hoping to recruit participants to help them test their hypothesis. “We’ve co-evolved with dogs over the millennia, but nobody really understands what it is about this dog-human relationship that makes us feel good about being around dogs,” said anthropology doctoral student Kim Kelly. Multiple departments at UA will team up with the University of California, San Diego to see if close contact with dogs strengthens health in older adults. “We essentially want to find out, is a dog acting like yogurt in having a probiotic effect?” Kelly said. We know already that children who grow up with dogs tend to be healthier than kids who don’t. They suffer fewer respiratory and ear infections, and see a decreased likelihood of having asthma and allergies. Our immune systems are fortified by exposure to small amounts of bacteria that it learns to fight off. Routine exposure to dog germs make kids immune to them. Other research has shown that dog owners generally tend to be happier and have decreased risks of heart disease. So now scientists are hoping to prove that as with children, adults who share dog gut bacteria are physically healthier. “We think dogs might work as probiotics to enhance the health of the bacteria that live in our guts. These bacteria, or ‘microbiota,’ are increasingly recognized as playing an essential role in our mental and physical health, especially as we age,” said Dr. Charles Raison, researcher and UA professor of psychiatry in the College of Medicine. Participants in the study must be at least 50 years of age and cannot have lived with a dog for at least 6 months. They will be paired with a humane society dog that will live in their home for three months. Investigators will non-invasively evaluate the participants’ diet, physical activity level, gut bacteria, and immune function. The dogs will be similarly evaluated. The exams will be repeated after one, two, and three months to see if there have been any positive changes on gut microbiota in the humans or dogs. They will also see if there are any changes in the humans’ and dogs’ health and emotional well-being. 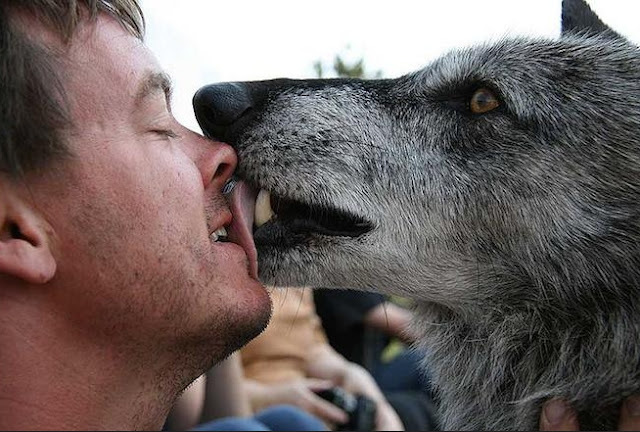 Responses to "New Study Shows Dog (And Wolf) Kisses May Be Good for You"
This is amazing and absolutely fantastic. 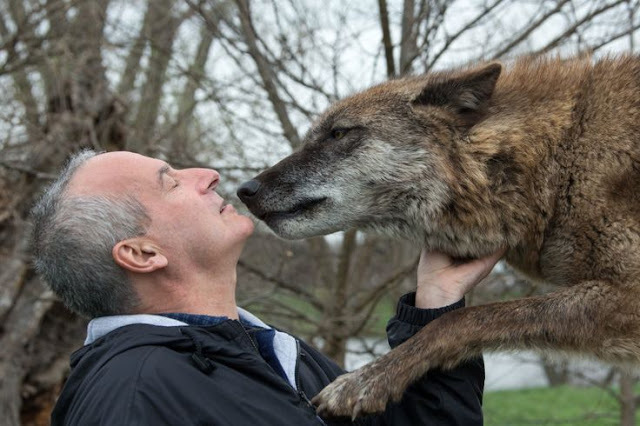 I adore wolves and feel they are misinterpreted by the public. Give the wolves a go and you will find they are just like your own dog. Normal dogs go be aggressive in a pack just like wolves. Actually, we have known this for a long time. While we may not know about bacteria changes we do know that people with animals live longer and are less likely to get sick. There is not only the psychological aspects of having an unconditional loving companion, but the responsibility of having to take care of the animal. As we know dogs pick up and eat all kinds of things and drink from puddles, there mouths are clean. 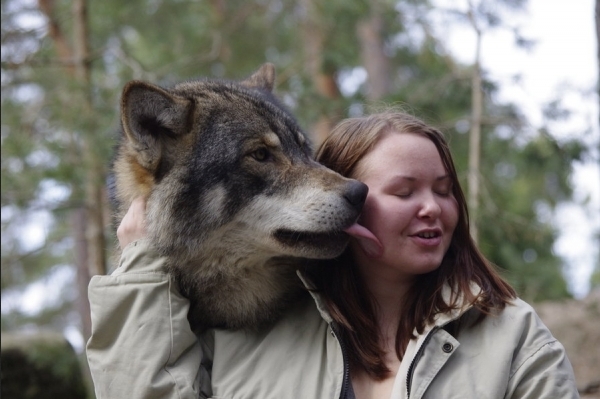 For example, a dog or wolf licking an open wound will actually clean it. Not only have there been studies, but I have had personal experience when having fallen and a dog cleaning the open wound when there nothing else around. More information is always needed and the studies are good. Good luck with your research project. Silly as it may sound....whenever I have a "boo-boo" it ALWAYS heals faster when my dog cleans it. I have experimented with this several times and have found it always works!! This,is the best news, since I have known this,for years, and will never libe without a,canine in my life, be it wd, wokf,or,northern breed. I totally agree with this. I grew up with dogs, as did many of my friends, and I don't recall any of us having asthma or allergies. I would even go further, to say I believe something in dog saliva helps wounds heal quicker. My dogs have licked cuts and scratches that I've had and they have healed very quickly, with no infection. My nanny my first two years in life was a collie.I grew up with cats, and were a frequent visitor with my uncles' horses. Husband loves cats, but is allergic. We have dogs. We are only sick when we are sneezed on by some unconsidering piece of humanity who should keep himself at home having the flue. Dogs licking makes things heal faster if we have cuts or bad spots. I think it may have more to do with the kissee human feeling good and loved when a dog kisses him/her. The feeling good prolongs life. I know it works both ways. My Min-Pin, while being a certified true-to-breed drama queen (OK, he's half Italian Greyhound) loves to lick any bare skin he may reach. Toe-jam, noses, ears, glasses to name a few. I know he shows affection, and may actually like the salt excreted in sweat. He can't wait 'til I get done with outdoor work to give his special bath-in-a-minute. Some friends of ours who owned a steak house in Springdale, AR, had two of the most beautiful husky-somethings I've ever seen, and they both swear that their boo-boos healed faster with their lickety-split wound treatment. I imagine a steak knife used on a particularly stubborn cut of beef might result in big boo-boo. I have a thought; since domesticated canines have been with us and bred to death, could this exchange have mutually beneficial immune system responses? Being in the company of dogs is heaven! From the warmth of their hugs, the beautiful trust that develops between you, the funny unexpected things they do,.... to getting out and enjoying fresh air and nature on your treks.....better than winning the lotto any day! Lived with a dog in childhood. Later in life got busy with higher education, career & then marriage/kid. Now entering middle age. Got another dog now who is growing along with my kid. Love history repeating. Dogs made & still is making my life fantastic. Wanna give the same experience to my kid. I've always been around dogs and wolves. I was raised with both working dogs and rescues. Some of the rescues were hybrids, but they all need homes and love, just as we do. I think this is a fantastic project and it's too bad I don't qualify to participate. We have been without a dog for 3 years while we wait to sort out a new house. Thanks to some stress and possibly now, a lack of a dog (!) I have got an autoimmune problem ...hyperthyroid Graves disease) I like to think getting a dog will help me just a bit after reading this. I have wondered about this and it makes perfect sense that exposure to healthy dogs and other animals is a way to safely increase exposure to new microbes. I have 3 dogs and I would guess that walking them 3 times a day also helps boost my immune system, as does throwing balls, playing with them and generally sharing my life with any super energetic and highly physical beings. I absolutely agree and ask for doggie kisses all the time. 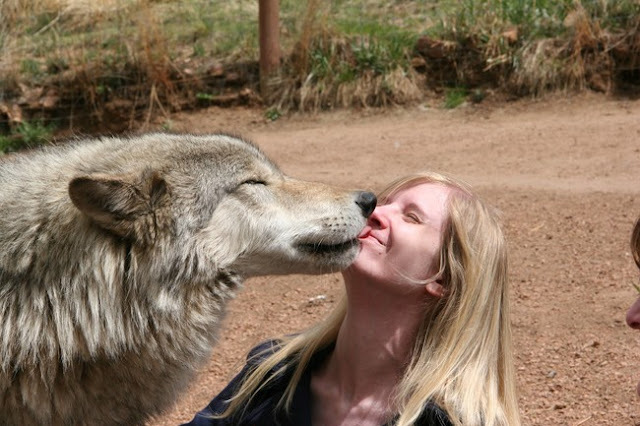 Now I just want to know where I can get wolfie kisses. I have a Wolf Hybrid, now a lot think that they do not exist. Yet I know He is a Hybrid because his mom was Husky and Timber Wolf and Dad was St. Benard and Austrilian Shepherd. with 4 Breeds that makes him a Hybrid and not a Wolf Dog. Yet through the Six years of his life He has become a Registered Service/Support Dog for Sleep Apnea and Diabetes. Wolves as a lot of people do not know have bigger brains than a regular Canine and what you would think is agression amoungest the pack is actually there way of playing. I learned this when mine was a pup because I had 3 of them and believe me when they were only playin it seemed as if they were fighting yet they never hurt each other.The Wolves that you find outside of captivity will not associate with man because they know what man is capable of yet on a small island up in the Canadian Region their is the White Wolf other wise known as the Arctic now they will associate with Man because they have never had to live amoungest man and they are curious. I use to take my three to a nursing home where my mom and dad are at and all of the Elders their loved them. The Big Dogs are the Healers whether it be healing the body or the Spirit. Only love to wolves,have had hybrids and they are the best family dogs ever,wolves main skills are to protect the pack and race puppies with respect and love!Dam trappers and hunters that split there family like terror do these days! All the best to y all! My dog (Little Wolf, or Faelan) gives me a kiss every morning. A few tiny licks; I don't let him give me as much as he would like. But yes, he gets to touch my face and lips. He is part Irish Wolfhound, and is very wolfish. I never get sick. I hope it's true. I know it's an hypothesis, but I hope it's true. I believe this to be 100% true. They also didn't mention that women who nurse around dogs pass on much more benefits to their infants.